The word “fake” often brings about a negative connotation to people. From fake paintings to fake personalities to fake faces, we typically associate “fake” with bad things. Yet, sometimes fake things can actually be good. 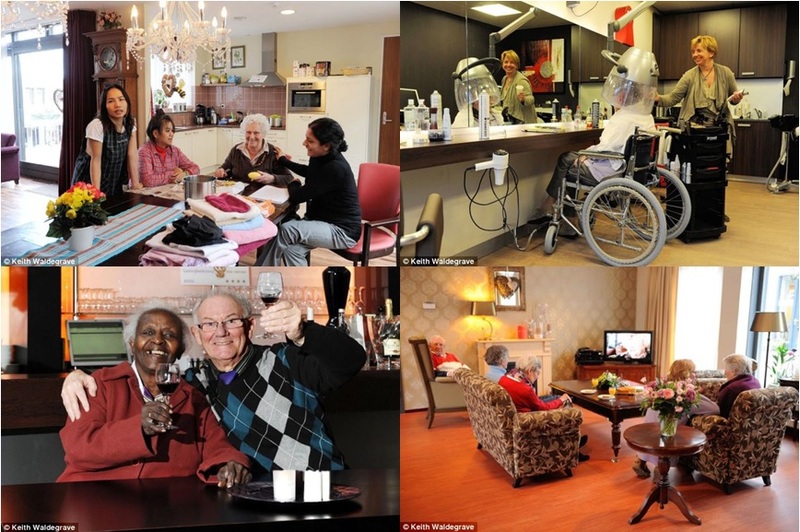 I recently came across a picture on Facebook talking about a new type of nursing care facility in the Netherlands (See above). My grandmother suffers from some mild forms of dementia, and I know the troubles it takes to help her remember things that just happened recently. My family has always tried to help her recall her memories and try to stop the dementia, so seeing a care facility that embraced the dementia, instead of fighting it, really intrigued me. My curiosity urged me to take a more in depth look at this new way of treating dementia patients. Known as Hogewey, this care facility is set up like an actual village, with an actual town square, supermarket, hairdressing salon, theater, pub, and restaurant, as well as twenty three houses. All the elderly residents there are sufferers of dementia. Unlike traditional nursing homes, Hogewey uses reminiscence therapy, allowing dementia patients to live out their lives as they did before in their heydays. The patients there live like they have real jobs, and do all the necessary shopping, cooking, and socializing as they would do in the real world. The doctors, nurses, and caretakers dress up as store clerks, servants, or neighbors, trying to make the experience as real as possible. All the houses in the village are customized to fit the lifestyle of each patient, through the way the home is decorated, the food, the music, and even how the table is laid. In a way, the patients there are living in a hyperreality, with time stopped and past memories actually come to life. This new way of taking care of dementia patients not only reminded me of my grandmother’s dementia and how we tried to help her overcome it, but also reminded me of the processes of innovation that we were carrying out in our Innovation/Idea-Farming project in our English class this year. The creators behind Hogewey were able to address a need in this world, and through it, create this new, innovative way of helping out the elderly. Realistically speaking, implementing something like Hogewey here in America would be very expensive and probably only the rich would be able to afford it. However, this idea is still a very great way of helping to solve the problem of caring for dementia patients, and it would be very cool to see it implemented in other areas throughout the world. This entry was posted in Re:Framed, Realist and tagged alzheimer's, care, caregiver, creative, dementia, elderly, facility, fake, hogewey, idea, ideas, innovation, innovative, netherlands, new, nursing home, real, reminisscence, therapy, world. Bookmark the permalink.